Hi pinups! When I found out my home town Shrewsbury was getting an Abakhan shop, it was the most exciting news about a new shop opening in the town for ages! Finally, something I could get on board with. After shopping online with Abakhan on multiple occasions and seeing the chatter about the physical stores on social media, I knew this was going to be dangerous for my fabric stash (and bank balance). The shop has been open a few months now, and I wasn't wrong! 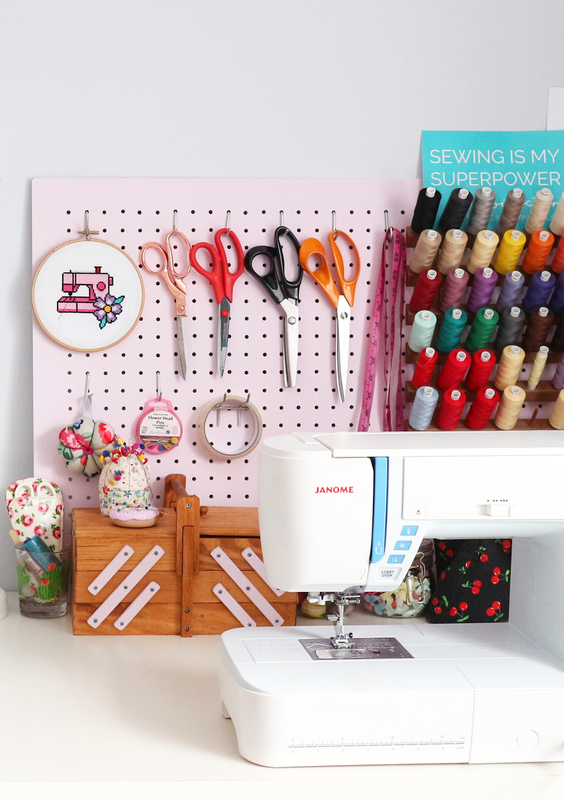 For this post, I've teamed up with Abakhan to create a Spring sewing project, with supplies from the Shrewsbury store! I spent so long in the shop on this occasion, there are some really gorgeous fabrics in store at the moment, it was hard to choose. Although a few of the fabrics I discovered on the day are still in my thoughts, so I think I'll be popping in again soon to see if they're still there. At the time, the sun was shining and Spring was in the air, so I've been a bit premature with my Spring sewing (oops). 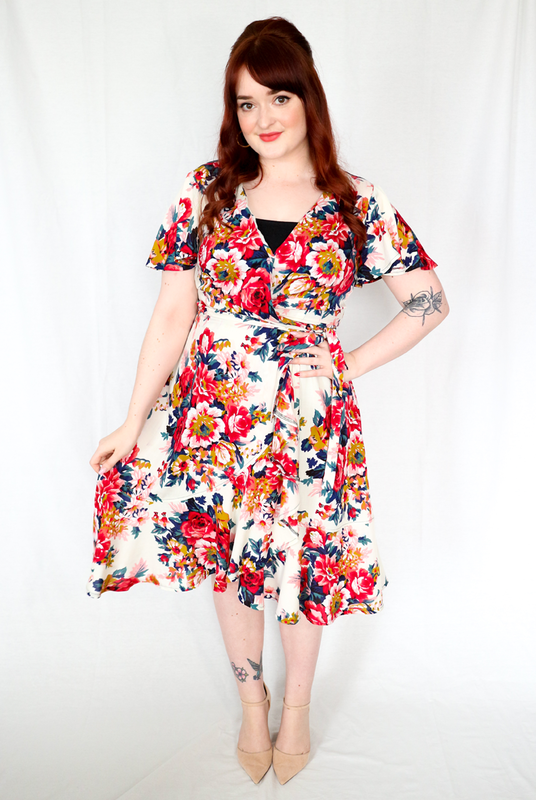 I couldn't resist the Simplicity 8637 wrap dress pattern, featuring the most beautiful looking flounce skirt. 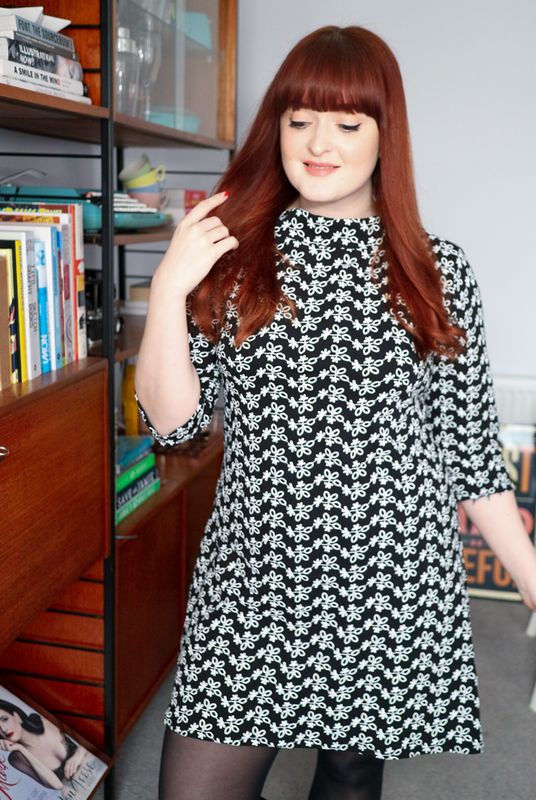 Whilst I know I've sewn my fair share of wrap dresses, I'm yet to successfully tackle a flounce skirt (I had a couple of issues with the dress in THIS post), and I thought the 8637 would be a great 'round 2'. Paired with a light and floral viscose fabric with the most beautiful colour palette, which I found in the fabric by the weight section in the shop. As someone who was new to shopping in the fabric by the weight section at Abakhan, at first I was a little confused as what that meant. I didn't realise you could get the fabric cut to your length (as long as you leave 1m behind), on my first shopping trip I ended up with a rather embarrassing amount of metres, but the price was so good I didn't question it! 1. 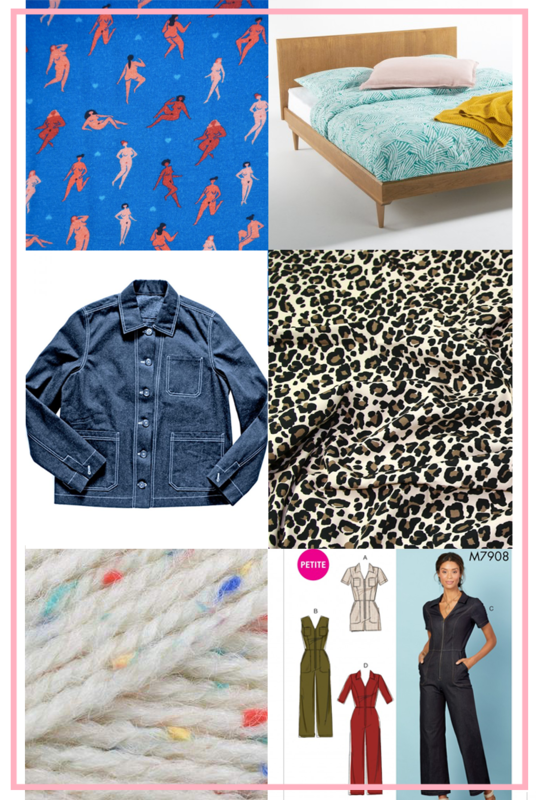 Rummage around the fabric by the weight section, find some fabric you love and make note of the price by the kilo. 2. Find the scales on the shop floor or at the till point and weigh your fabric to find out the price. 3. Have your fabric cut to length, as long as you leave 1m behind. Simple! 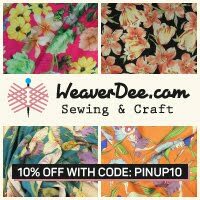 Lets get into the sewing! 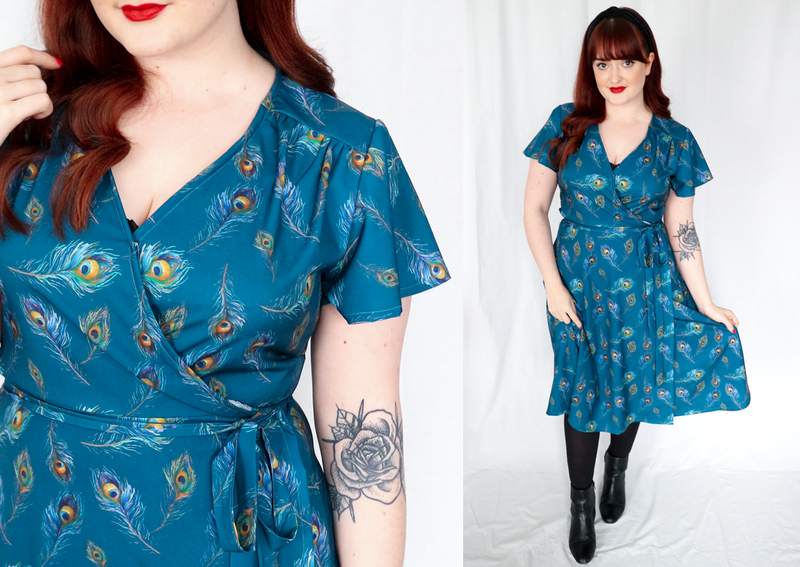 The Simplicity 8637 is a simple pattern to sew, the bodice is lined which I didn't realise at the time but I prefer to wear a slip under thinner dresses, especially wrap dresses like this, so I decided to create a facing instead. 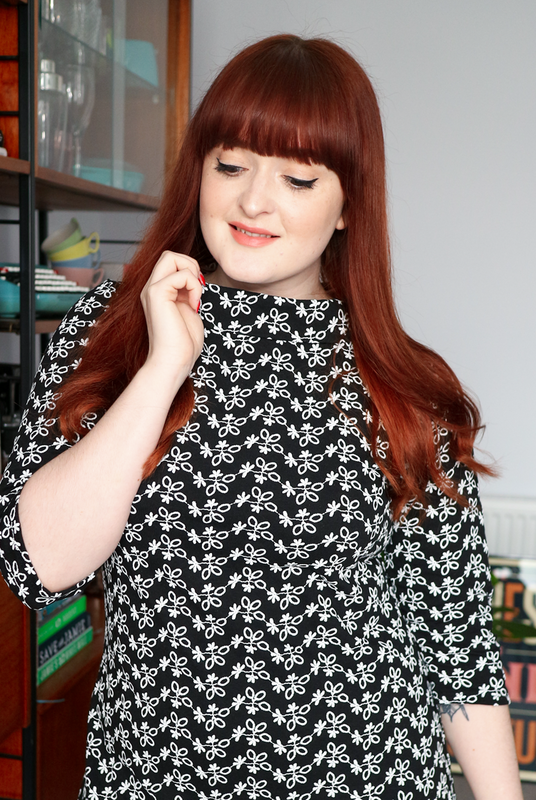 I also wasn't keen on the sleeve options the pattern had, so I switched them for the flounce sleeves of the Simplicity 8608 pattern, which I've pinched a few times as I love them so much. I also thought these would give the dress some balance with the flounce on the skirt. The sewing on this pattern is pretty straight forward, the only thing that I found confusing was all the flounce pattern pieces for the skirt which resulted in some unpicking as I stitched one the wrong way round! Hemming the flounce took a little extra concentrating too as you're sewing a curve, but with a bit of patience I got there in the end. I started with a rolled hem foot, but I gave up with that pretty quickly and opted to overlock the edges and turn them up. Lots of pins and ironing! I love the result as it's so fun to wear. I do have some fit issues with this dress which I'm a little annoyed about. With Simplicity, I'm usually the same size every time so I went ahead with my usual. This bodice is a little long in the body for me and small across the bust and doesn't provide me with as much coverage as other patterns. Next time, I think I would just switch the bodice for one I know fits me better at the front or add a little extra to the pattern on the neck edge. Doing full bust adjustment to the front darted bodice would also be a way to solve this in the future. 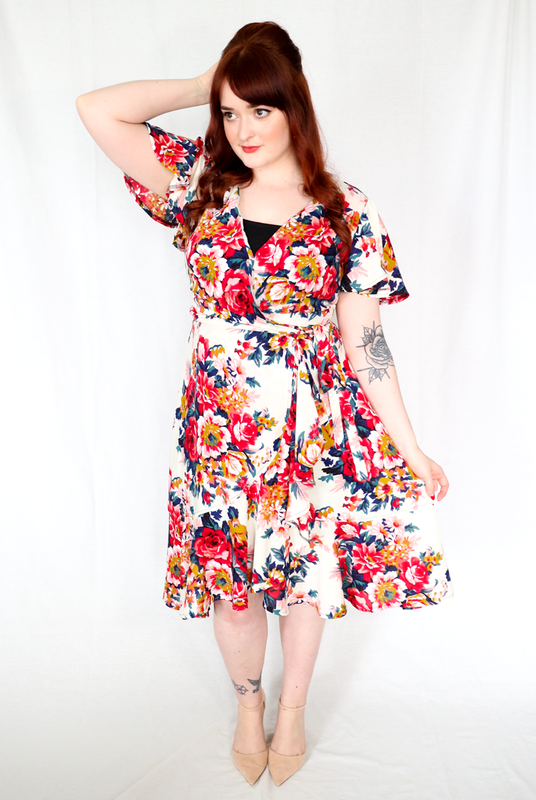 Other than that, this dress is a swishy dream and it's nothing a busy print and a safety pin can't fix/hide! 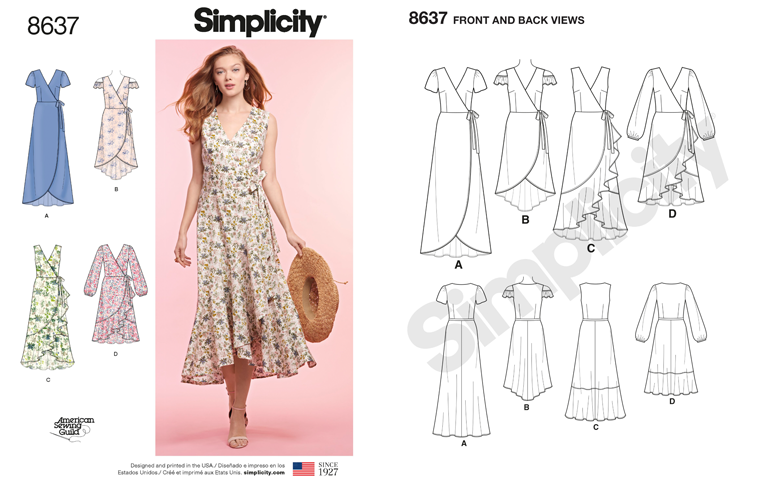 Pattern: Simplicity 8637 with 8608 flutter sleeves. Sewing time: I made this in an afternoon. Modifications: I didn't line the bodice, I created a facing out of the interfacing pieces. I also switched the sleeves. Fit: Too small across the chest. Difficulty: Simple! 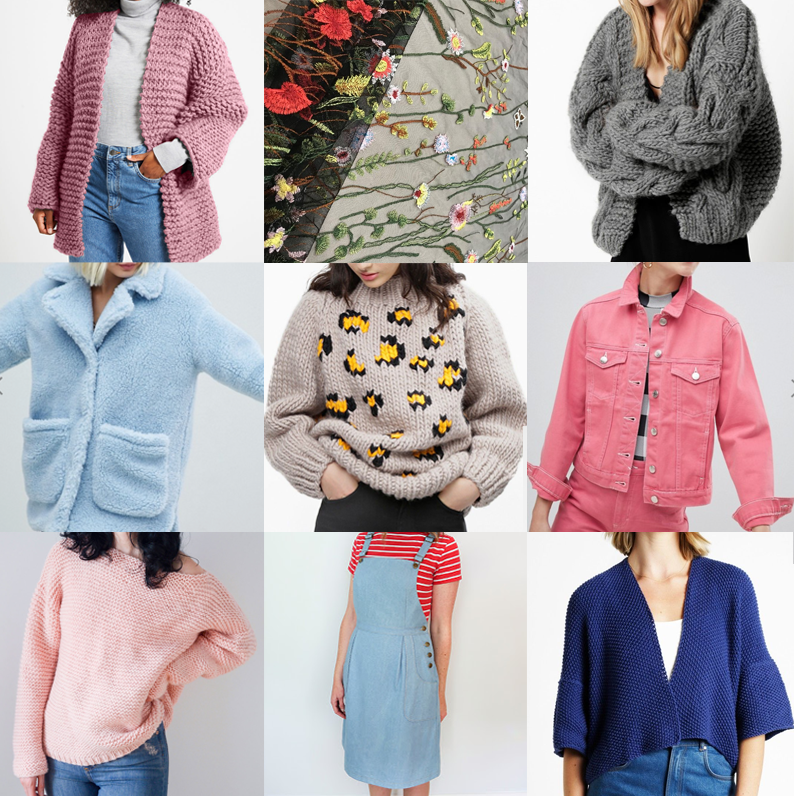 But all the flounce pattern pieces can get a bit confusing. Watch out for: Hemming the curved flounce skirt, take it slow with lots of ironing! Make Again? : Yes, with some tweaks. I love the skirt style of this pattern. But I think I'd switch the bodice for one I know fits me better. Overall, I really like this dress, but it's such a shame it's too small across the bust. I'll happily wear a slip underneath like in this post because that skirt is too good not to swish in! I love this pattern and can see myself making it again, but I'd switch the bodice for one I know fits me better/has a bit more coverage. 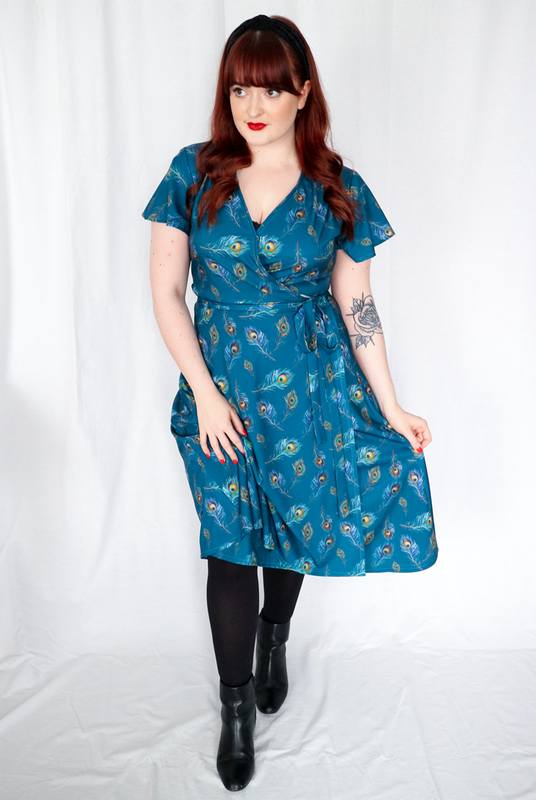 Although I've made a lot of wrap dresses and flounce sleeves recently (I'm obsessed and they're so comfy to wear), maybe I should branch out next though! 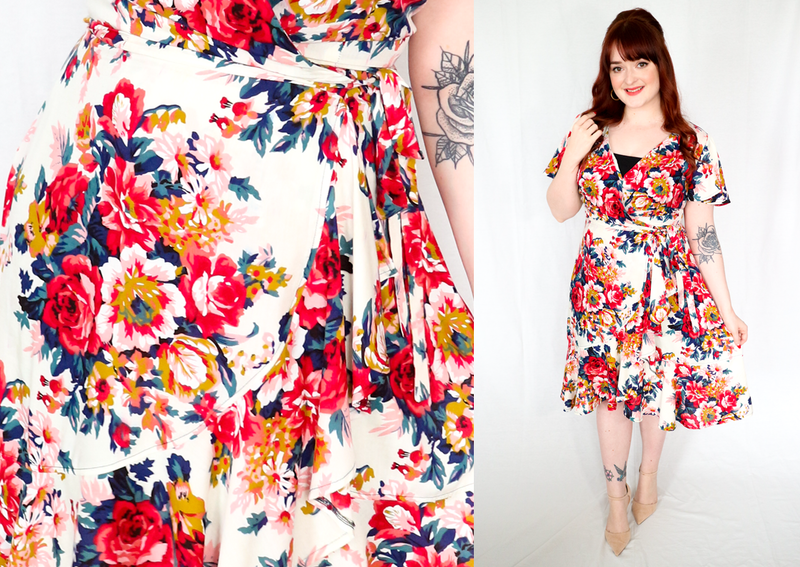 I've had this dress hanging up in the bedroom on display since I made it, the floral print on the fabric is so beautiful I can't bring myself to put it away in the closet just yet as it makes the room feel like summer! If you're local to an Abakhan shop or Shrewsbury, come and visit the shop for yourself and find some fabric gems! I love digging through the fabric by the weight sections as there's always something buried in there - I don't think I've ever left the shop empty handed! Check out what's coming up in store at Abakhan Shrewsbury HERE. Have you ever visited an Abakhan shop? What do you think? Disclaimer: This post is sponsored by Abakhan. 6. Addi gold glitter circular knitting needles! Hi pinups! It's time for my second What I've Been Loving... post this year and what a weird month February was. The weather felt like Spring and it completely flew by! I dabbled in some eager Spring sewing and fell in love with the Myosotis dress pattern and plotted some lighter weight Spring knits with some aran weight yarn. I've sure got lots to keep me busy in March and my sew-jo (and knit-jo) is in full swing. Hi pinups! 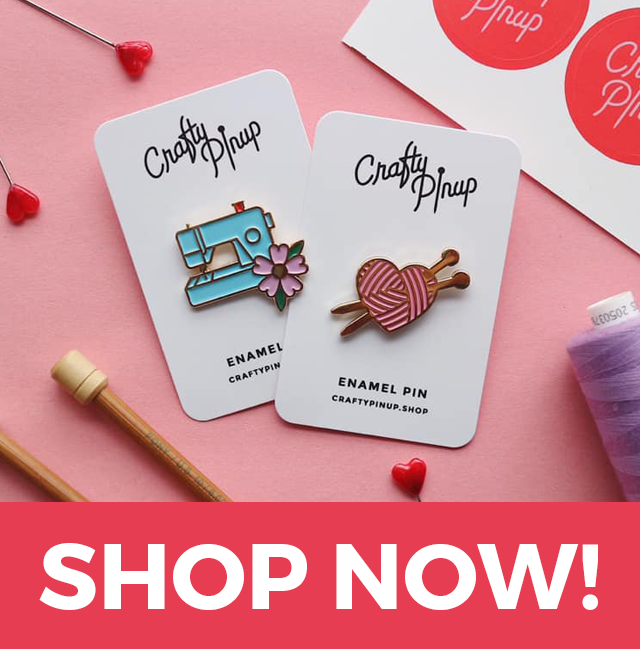 Today we're talking all about cross stitch to celebrate the launch of my brand new Crafty Pinup Sewing Machine Cross Stitch kit! I've always enjoyed cross stitch and I thought my sewing machine design (seen HERE as an enamel pin) would translate well into a cross stitch design. Mine's hanging up on my peg board in my sewing space, which you've probably already spotted if you follow me over on Instagram! 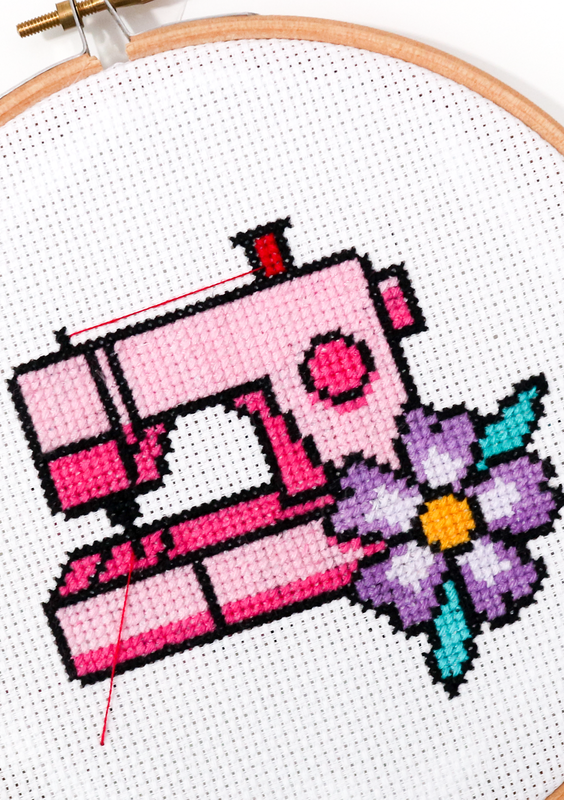 In this post, I've written my full 'how to' guide on simple cross stitching to make sure you end up with an awesome cross stitch you'll be proud to hang up! To buy my Sewing Machine Cross Stitch kit, go HERE or to download my PDF pattern go HERE. Each square on the grid represents a single cross stitch. Each symbol indicates a different thread colour, outlined in the table below the pattern. The arrows on the pattern indicates the centre of the design. The thread sorter contains all the thread you need to complete the design. Always put your thread back on the sorter in the correct place, as you may need it at a later point. Each embroidery thread comes in 6 threads. but only 3 strands will be used for each cross stitch. Split each piece of thread by carefully pulling it apart into 3 threads. To ensure you don’t run out of thread, don’t leave a tail longer than 1”. 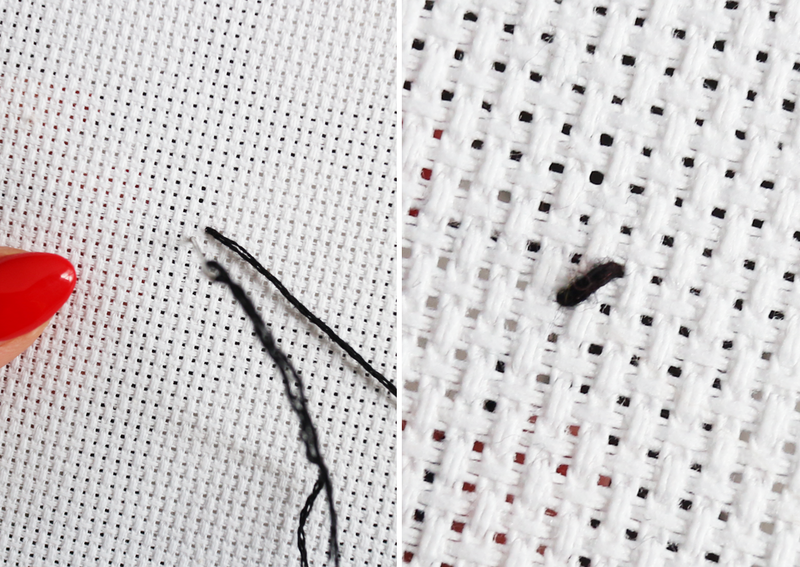 It’s helpful to find the centre of your fabric before you start, to ensure your cross stitch is central. This is indicated on the pattern where the two arrow lines cross. Place your fabric between the hoops & tighten at the top so your fabric is pulled nice and taut, like a drum. Thread the needle with your starting colour. 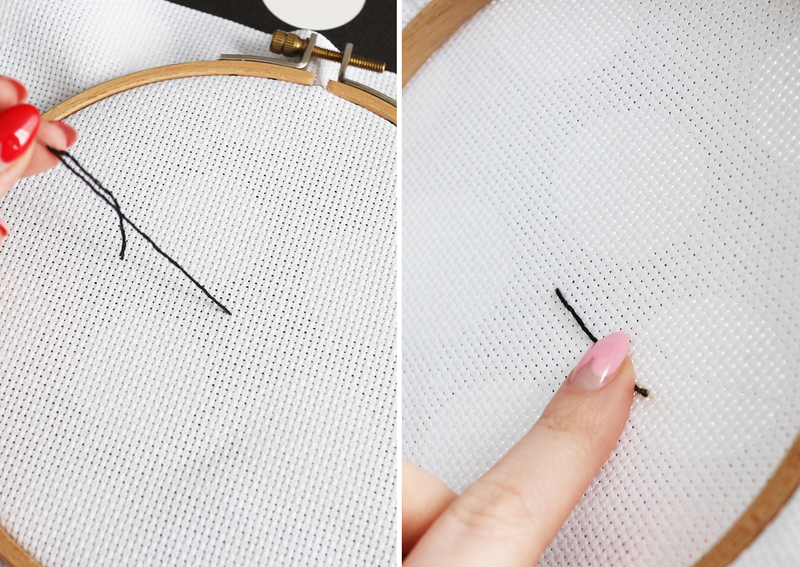 You will secure this thread by keeping your finger pressed on the loose tail at the back of your work and stitching over it whilst you work your first few stitches. Repeat this for each time you thread your needle. Once you’ve found your centre, it’s time to start stitching! I’d recommend starting with the the outlines of the design first. Cross stitch is generally worked in rows going from left to right so refer to the pattern to choose where you’d like to start, close to the centre. Thread your needle with your chosen colour. You will secure this thread by keeping your finger pressed on the loose tail and stitching over it whilst you work your first few stitches. 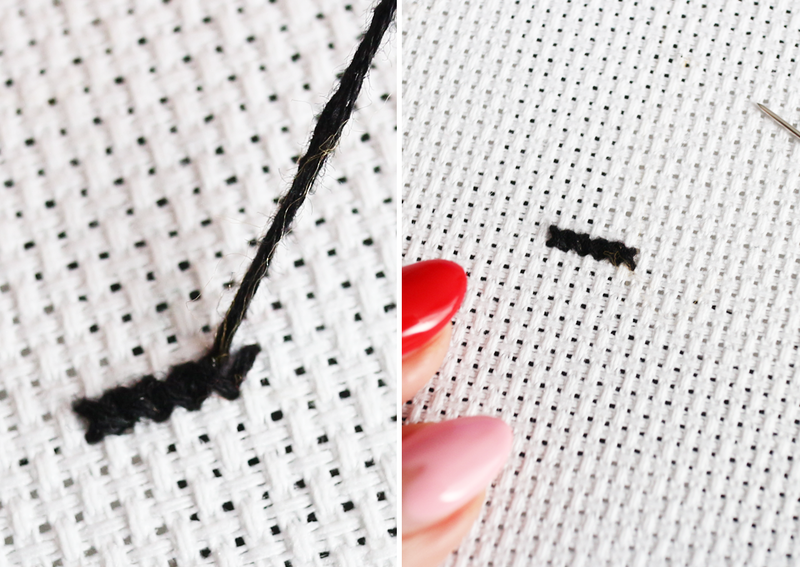 To make a row of cross stitches, insert the needle from the back side of the fabric, bringing your needle through a hole toward the front, leaving about an inch of thread at the back (your tail). 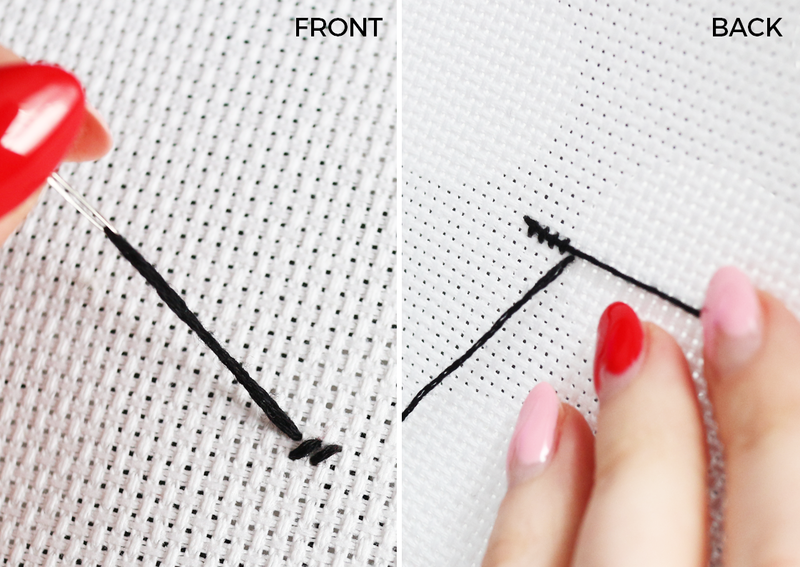 Next pass your needle through the hole diagonally across from where you started, creating a ‘/‘ or ‘\’ stitch. Then bring your needle back up through the hole that is directly below the one you last used. Make sure your tail will be trapped by the stitch on the backside of your fabric. Continue stitching along the row to create a series of half cross stitches. Next return across the row making a series of half cross stitches in the other direction, creating your finished row of cross stitches. In some spots, its easier to create individual cross stitches rather than working in rows. Choose whichever you prefer. Just make sure each diagonal stitch goes in the same direction each time so your work is consistent. When you need to use a new piece of thread leave your tail again about 1” long at the back. Start stitching with your new thread in the same way as before, but make sure to catch both of the loose tails under at least 3 stitches. 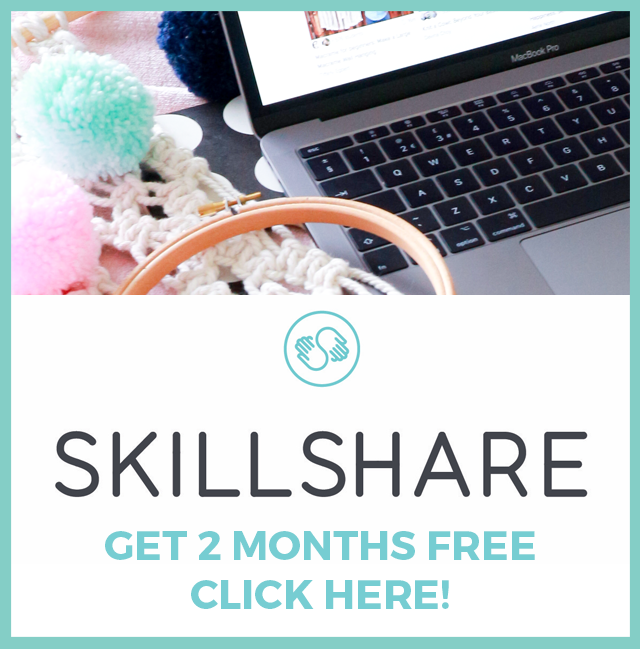 You’ll quickly get comfortable with cross stitch and find which method of stitching you prefer. Take your time and just have fun stitching! Once you've completed your work, you need to show it off and display it! You can simply use your hoop to display your work if you like. Make sure your work is central in your hoop and your screw is tightened. Trim down your excess fabric at the back of your work, leaving enough to glue down. With a hot glue gun, carefully fold your fabric neatly down and glue to the hoop. You can also add a cut out circle of card or paper to hide the back of your stitching. 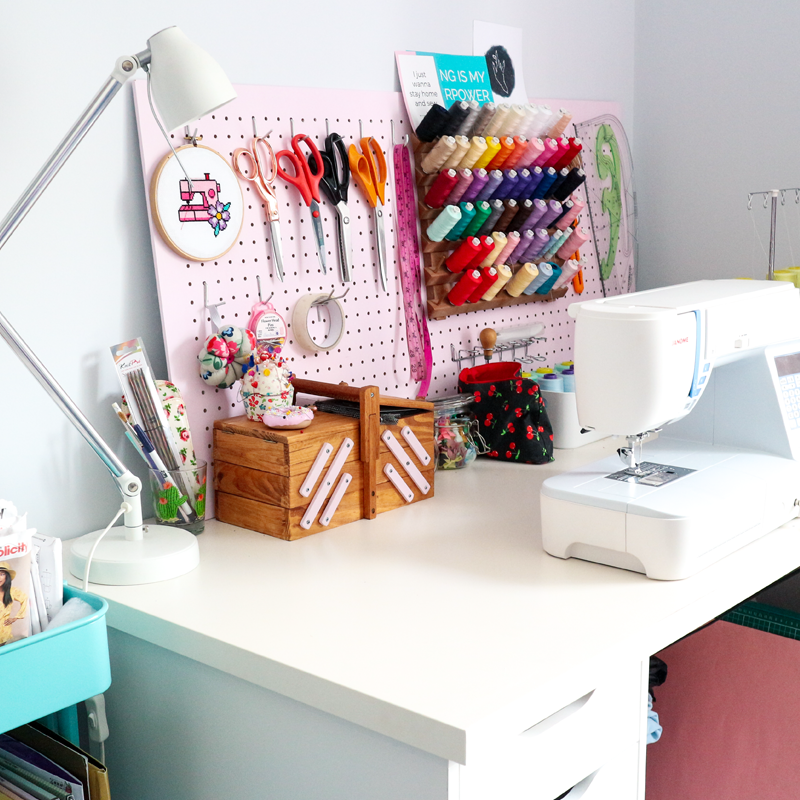 For my work, the hole at the top of the hoop sits perfectly on my pegboard, but perhaps try adding some ribbon to hang your work too! Or even glue a trim around the edge of the hoop for an extra touch of customisation. 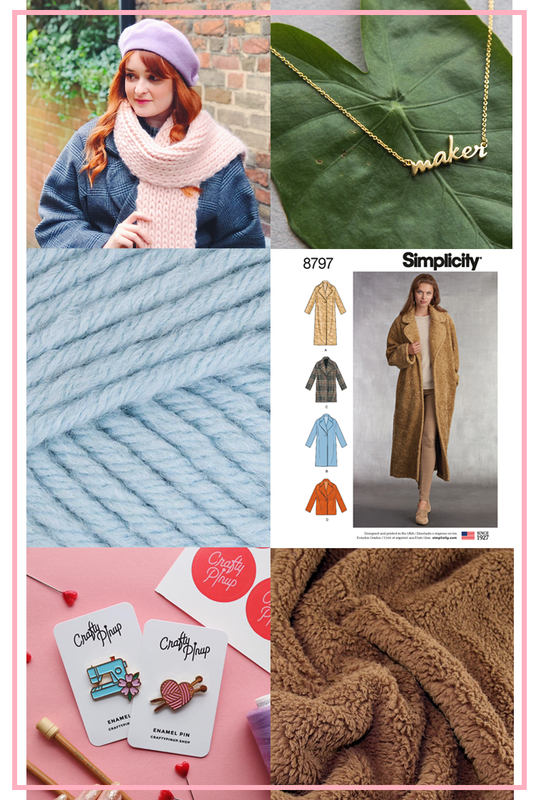 I hope you've found my how to cross stitch guide helpful. 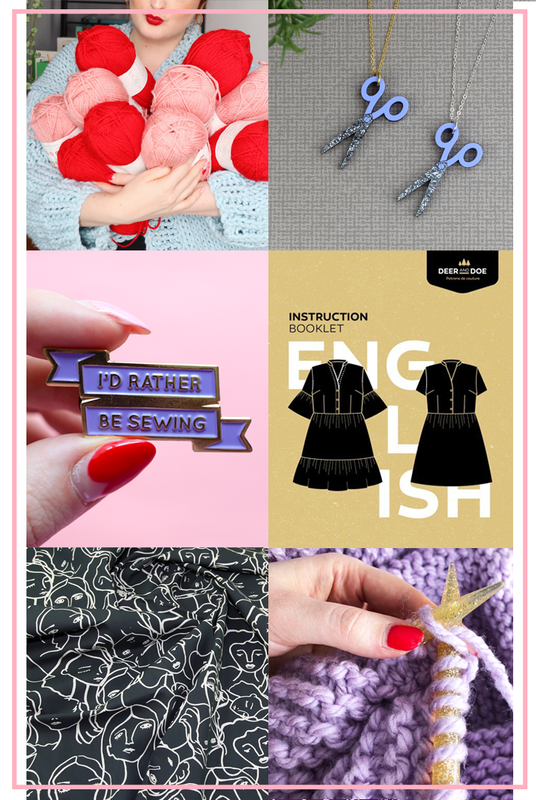 There's lots of resources online about cross stitch but in my post I've broken down my own preferred way to stitch, with what I hope are some clear photographs for you to reference. 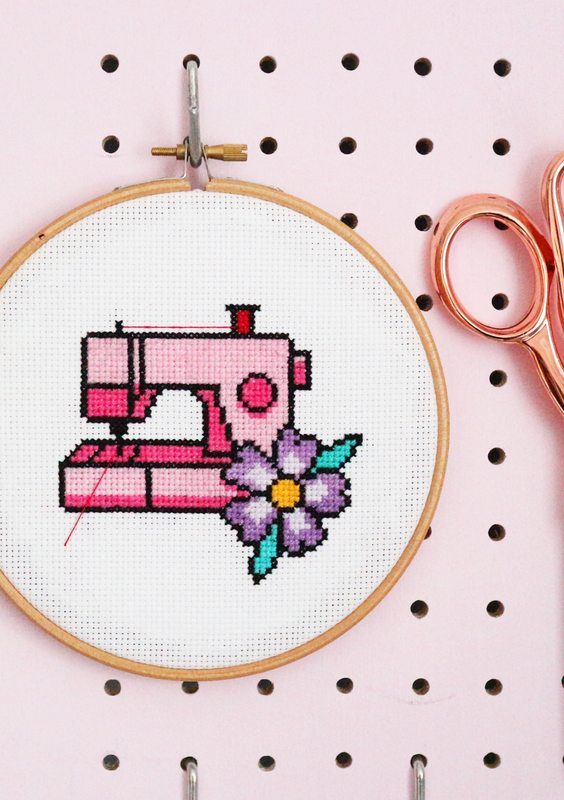 If you try out my Sewing Machine Cross Stitch, which is also perfect for beginners, I'd love to see your progress and finished work hanging up in your own sewing space! 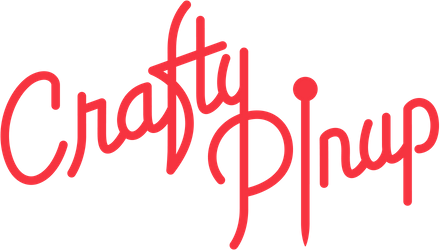 Please tag me on Instagram @craftypinup and use my hashtag #craftypinupshop so I can see and share your makes. 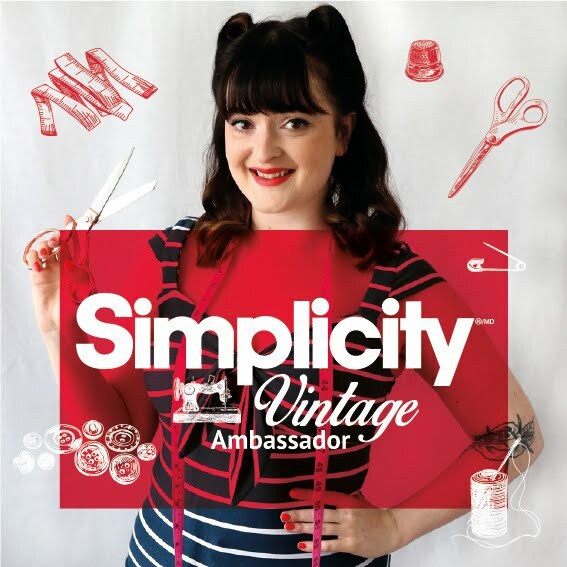 "As a vintage - inspired clothing company, we’ve gained a loyal customer base of Boppers who return to shop with us not only for our flattering and feminine silhouettes but for the fun, bright and bold prints too. If you’re after some new printed fabric to inspire your next sewing project, we’ve got just the thing! To say, "Thanks Sew much!" we’ve released a coveted collection of ten individual prints taken from our bestselling styles, now available in both Crepe de Chine and Scuba in 1 & 3 metre lengths. From makeup bags, swing dresses to jumpsuits – the creative crafting options are endless! There’s only one question left to ask; with the help of Lindy Bop, what will you create next?" For the full fabric collection shop HERE. 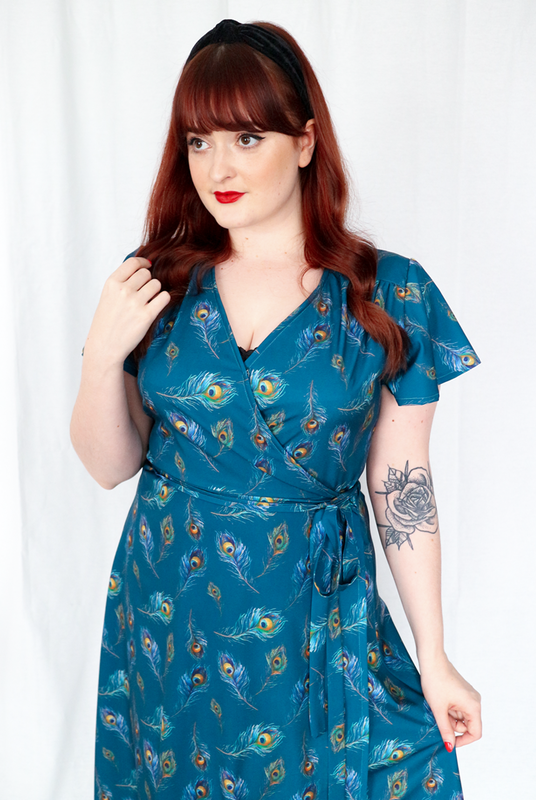 I chose the teal peacock feather fabric in dreamy crepe de chine. This beautiful print was created in house at Lindy Bop using watercolours. This lightweight, floaty yet opaque fabric has a lovely handle and drapes elegantly. 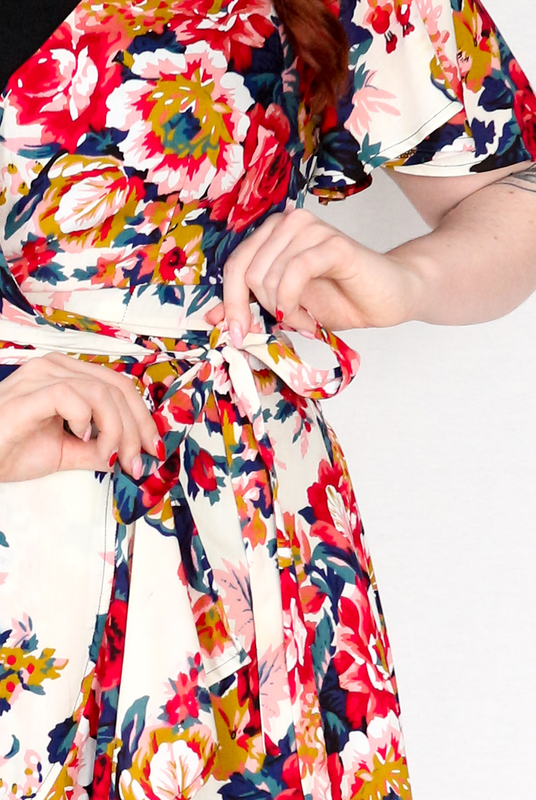 It was great to sew with and it's perfect for a Spring wrap dress like this. 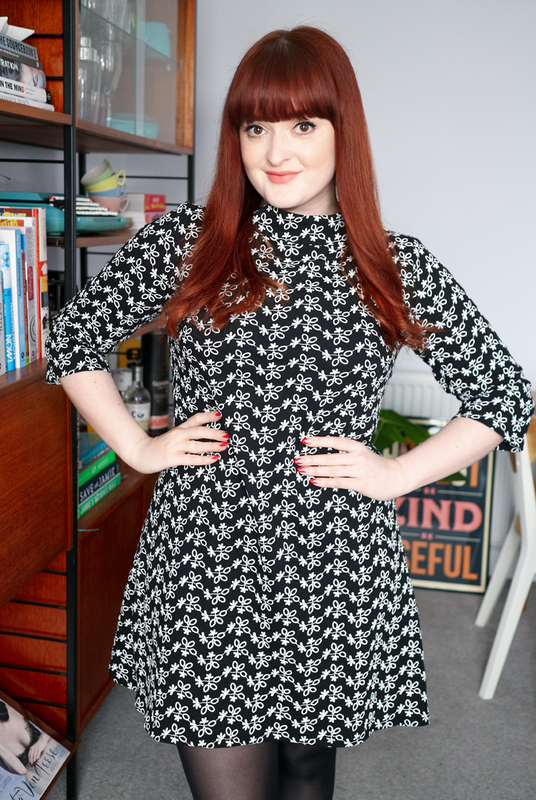 You know I love a wrap dress and with Spring just around the corner it's time to leave my coat sewing behind (for the time being) and start to think about some dresses again! 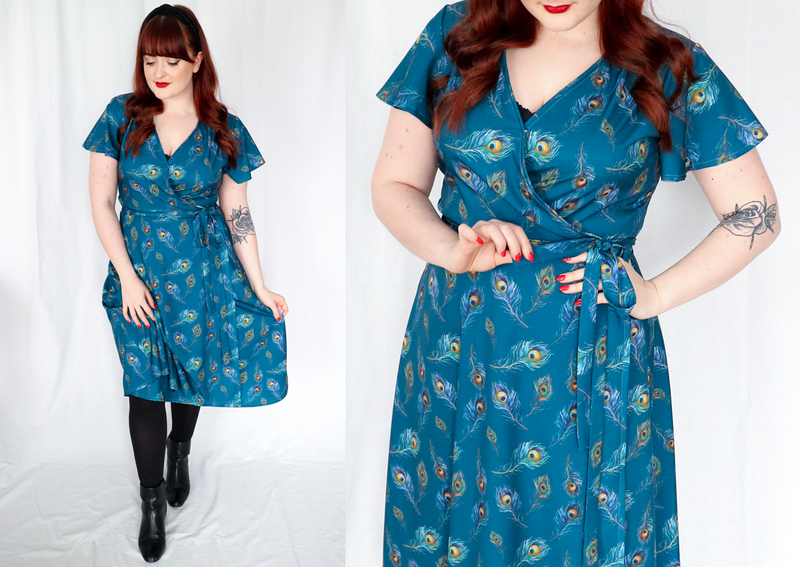 I've made the Sew Over It 'Eve' dress a couple of times, it's become one of my favourite patterns. I thought it would work beautifully with the drape of this crepe de chine fabric. 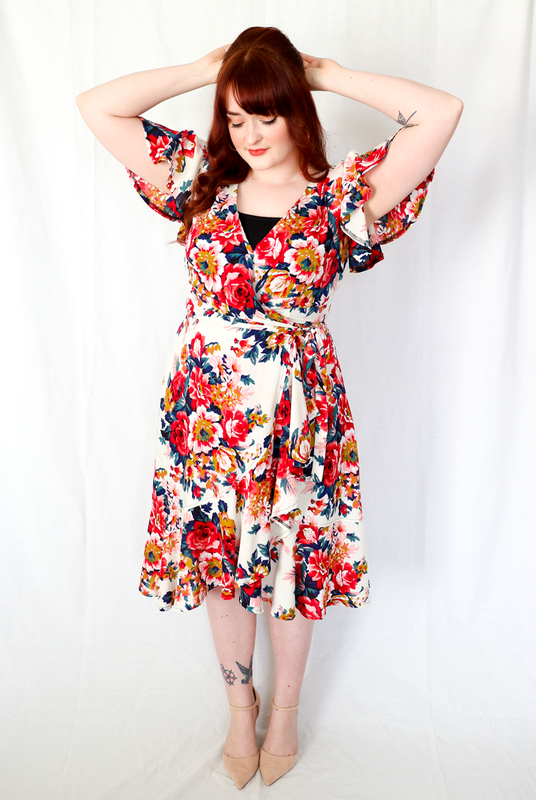 For my full sewing pattern review for the 'Eve' dress pattern, go HERE. This fabric was a real treat to sew with. I haven't used a fabric quite so lovely in some time, as I usually stick with cottons or jerseys. 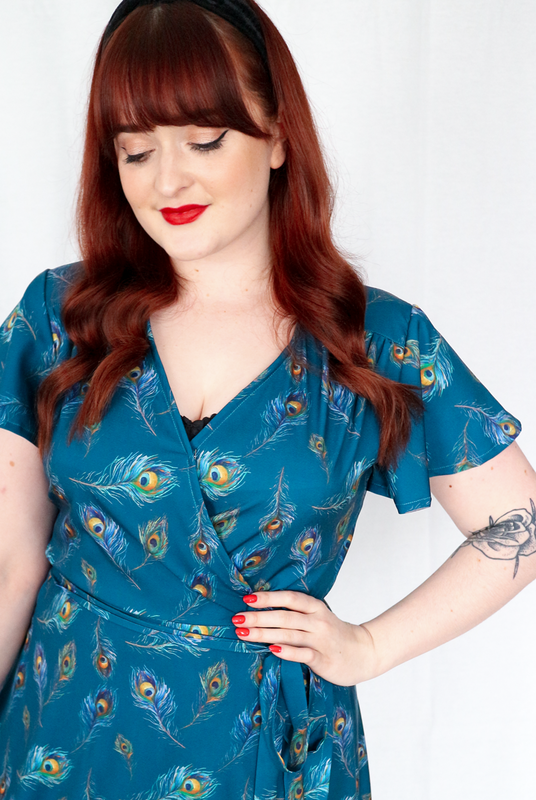 Making the 'Eve' dress in this silky crepe fabric makes it feel so much more special than usual and I'm definitely going to need more of this fabric type in my life in the future. The drape of this fabric is truly beautiful, but not in a clings-to-all-your-lumps-and-bumps kind of way (which is probably why I normally stay clear of crepe). Instead it seems to skim across everything and is surprisingly flattering. There's also a bit of stretch in the fabric, meaning it doesn't look tight across my bust and is so comfortable to wear. 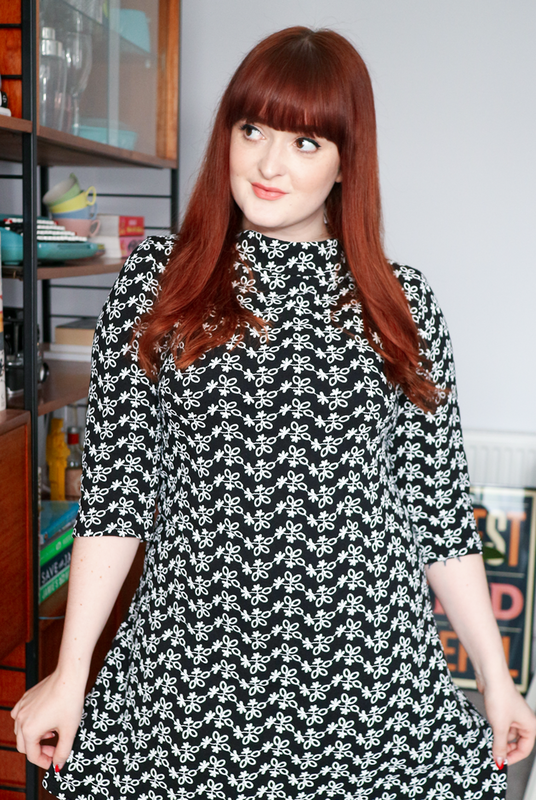 On this version of the Sew Over It 'Eve' dress I do have a bit of gaping at the bust. With my original cotton version, as the fabric was stiffer, it was easier to pull tighter around my body and it held it's shape. Although with all wrap styles I always pop a safety pin at the bust just for security, I found with this dress I couldn't have gone without one. But I'm still very happy with it! This dress definitely has the swish factor. For this look I paired the dress with tights and heeled boots, but I think it will be lovely in the Summer with a pair of sandals and a straw bag! I also don't wear a lot of blue so this dress definitely felt out my comfort zone but I'm surprised at how much I like the tone of it. Overall, this dress is a teal dream! 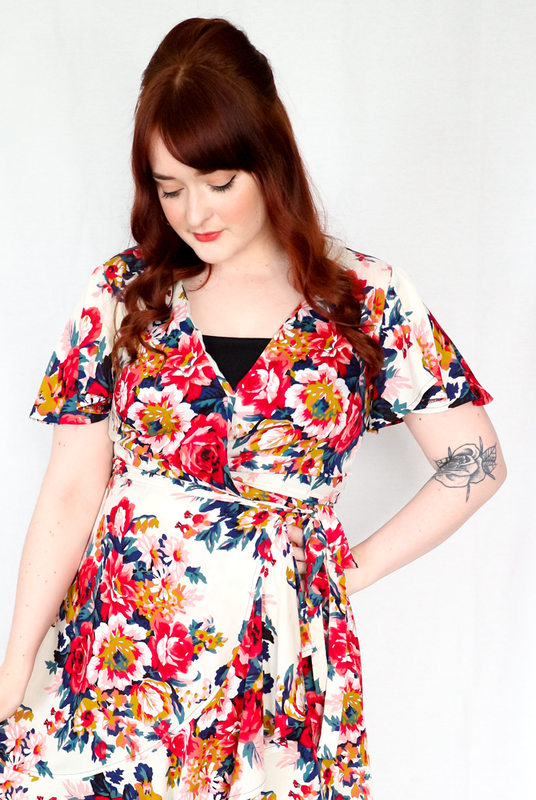 The fabric and pattern are a match made in heaven and I think I'm now a crepe de chine convert. 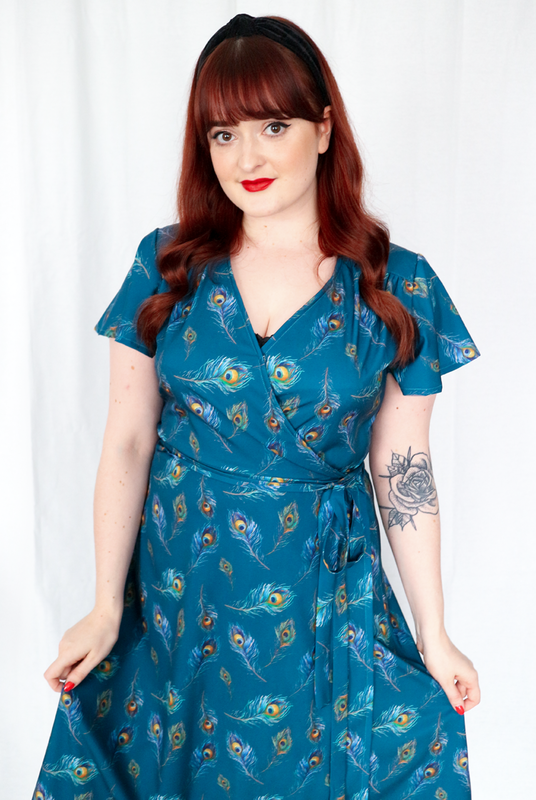 Lindy Bop are known for their vibrant range of prints for their clothes and it's exciting to see the launch of a fabric range within an online fashion retailer. There's even a bookcase print fabric HERE which I'm sure will be a sell out, it's so fun! Disclaimer: This post is sponsored by Lindy Bop. All opinions are my own.